When you smile, the first thought you have shouldn’t be about the colour of your teeth. Yet, after years of wear-and-tear, even those with pristine oral hygiene may experience the headache and embarrassment of tooth discolouration. While correcting damaged teeth typically requires fillings, Smile Gallery Dental Care believes dental restoration offers more than structural support. By using the latest dental advancements, restoring dental strength while maintaining aesthetic beauty can go hand-in-hand with white tooth fillings. When your dentist talks to you about tooth decay, your mind likely fills with unsavoury imagery of costly and painful dental treatments. While severe tooth decay often requires more invasive procedures, the majority of patients undergo dental fillings. This common procedure repairs the portion of the tooth that’s damaged due to decay, which is known as a cavity. The primary goal of a filling is to restore a damaged tooth so it functions and looks normal. Without this streamlined treatment, decay can continue and cause far more complications. As with many restorative dental procedures, you have options in how the treatment is performed. One of the most requested, and desirable, options is what’s known as a composite filling, or a white tooth filling. Unlike traditional fillings, which uses a grey metal known as amalgam, composite white fillings closely match the appearance of your natural teeth. Our goal with this procedure is to enhance tooth structural integrity without reducing tooth appearance. In most cases, it’s almost impossible to notice a composite white filling, which definitely isn’t true with standard amalgam fillings. Filling Gaps | If you have gaps between your teeth, also known as diastemas, composite fillings bridge this gap with a natural looking resin. Broken Teeth | The flexibility of composite fillings makes it ideal to repair a chipped or broken tooth. Correcting Teeth | Instead of invasive procedures, such as crowns or implants, composite fillings may be used to reshape a tooth. Composite teeth reshaping is often recommended for visible teeth in good condition. To achieve a natural appearance, suspended glass particles are mixed within a resin matrix. Because composite resin can be tinted to match the colour of surrounding teeth, the filling is nearly invisible. While a restored appearance is desirable, it’s the function of a filling is the most important result. 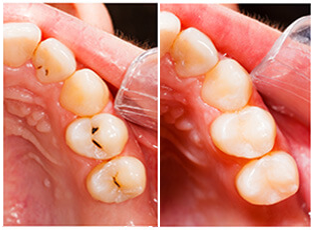 Composite white fillings repair the structural function of your tooth. A major concern with decay buildup inside a tooth is how it weakens its entire structure. Eventually, the tooth will crack and break off, which typically leads to a more serious, and painful, condition. The suspended glass particles keeps your tooth strong and durable. When your dentist determines you have a cavity, the first step is reviewing its severity. Along with examining the suspected tooth with a compact dental mirror, you may receive an x-ray for confirmation. The type of treatment recommended is determined by the extent of tooth damage. If your dentist determines a white filling is best, the procedure is quick and relatively painless. To begin, a local anaesthetic is used to numb the entire area. Next, a small drilling device, such as a laser or air abrasion instrument, removes tooth decay. After ensuring all decay is removed, the socket is sterilised. Finally, the composite white resin is applied in layers. Once completed, the surface is shaped so it fits naturally with surrounding teeth. The entire process is relatively swift and painless. If you’re experiencing even a small amount of tooth pain, or you’re overdue on a dental check-up, call Smile Galley Dental Clinic at (03) 8595 2632 and schedule your appointment today! While many dentists in Box Hill are well-equipped to handle dental fillings, few offer the compassion and experience as the Smile Gallery team!